DADS ARMY DVD & Magazine Collection COMPLETE !!! 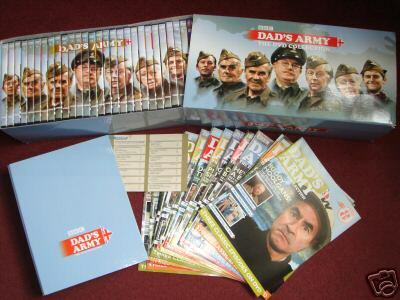 28 wonderful DVD's, featuring every Dads Army episode in existance. Includes rare interviews, stage show clips, photo galleries etc. Also includes 25 magazines to give you all the information you will ever need about Dads Army ! Notify me of updates to DADS ARMY DVD & Magazine Collection COMPLETE !! !